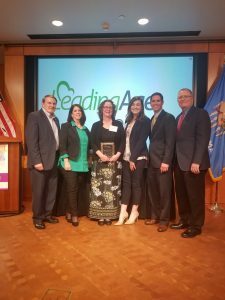 Baptist Village Communities (BVC) enjoys being a regular award recipient from LeadingAge Oklahoma, the state association of not-for-profit senior living organizations. This year was no different, as BVC took home three awards. This makes two years straight that BVC has collected three awards. Baptist Village of Hugo’s Connie Greer was named administrative support employee of the year. 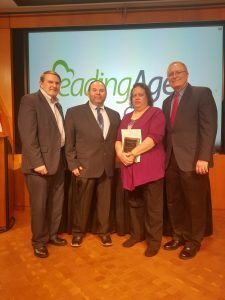 Baptist Village of Owasso’s Julie Duncan was named life enrichment employee of the year. 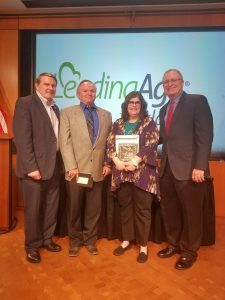 Teresa Lay was named non-resident volunteer of the year for her service at Baptist Village Honey Creek. Connie Greer has served as administrative assistant on the Baptist Village of Hugo Friends Team for 23 years. She wears many hats. These include office administration, billing, accounts receivable and payable, new team member paperwork, payroll and assistance with admissions. Connie excels at all of these roles and has taken on many other responsibilities, as well. She also has spent hours on her own learning the Electronic Health Records system. She is now the “go-to person” for questions about the program and is always patient in her instruction with other Friends Team members. Connie is the first person most people meet upon stepping foot inside the Village. Her smile and servant attitude also make her the person most residents, family members and other Friends Team members often to go with questions or requests. Connie’s long tenure adds great stability to the campus. Many residents know her from when their relatives were residents themselves. She often asks about family members or friends and knows them by name. She is always available to chat or listen to stories, and everyone knows she genuinely cares. From left, Bill Pierce; Mitzi Epperson, BV of Owasso associate campus director-health services administrator; Julie Duncan; Alaina Martin, BV of Owasso, assistant campus director-health services; Nathan Purifoy, BV of Owasso campus director; Steve Thomas. Julie Duncan has served Baptist Village of Owasso as life enrichment director since July 2017. She has been a blessing from day one. Julie was instrumental in expanding the Music & Memory program on campus from about two residents participating to more than 35. By adding new technology to the community, Julie has also allowed residents to better interact with family. Using the 72-inch screen iN2L system, one resident was able to see and talk to his daughter and granddaughter on his birthday. Julie’s dedication to going above and beyond to enhance residents’ lives has made a huge impact on the life enrichment team and campus. Julie has brought fresh life enrichment ideas and enthusiasm to the table. She focuses on what residents can do, not what they can’t do. She has a natural ability to genuinely connect with each person she encounters. More than seven years ago, Teresa Lay began volunteering at Baptist Village Honey Creek in Grove. Teresa is legally blind, which means she cannot drive to the Village herself. But that certainly hasn’t stopped her! She spends much of her time in an administrative role in the office. This has allowed Friends Team members to step away from the office if they need to and know that the office is in good hands. In addition, Teresa organizes bingo and helps arrange for luncheons, birthday parties and many other special events throughout the year. She often spends her own money to make sure these events are decorated well. Teresa constantly looks for ways to assist. She brings food or organizes meals when needed, and she is never too busy to listen to residents. She is ready to help or just lend an ear – whatever the situation calls for. She also makes sure residents are visited during hospital stays. Giving without expecting anything in return makes Teresa an invaluable and much-loved volunteer at Baptist Village. Connie, Julie and Teresa are just three more examples in BVC’s long tradition of outstanding service. This passion is carried out daily to more than 2,300 residents, clients and guests. For more information about Baptist Village Communities, visit www.baptistvillage.org.